2 Bedroom + 2 Bath Condo - Luxury Upgrades Throughout! Enjoy this two (2) bedroom with two (2.5) bath condominium for your ski vacation this Winter. 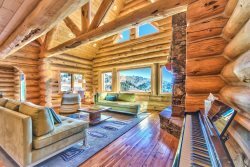 Furnished with mountain style design and comfort, this two (2) level floor-plan has plenty to offer with an large master bedroom upstairs with multiple beds for overflow sleeping if needed. Lounge on the couch to watch TV and warm by the gas fireplace or visit the community hot tub located behind this Building. Moose Hollow condos have ski closets in the foyer to accommodate skis, snowboards and other gear. Moose Hollow Condominium development has a lot to offer with 168 condos in 14 Buildings. The Buildings have a distinctive style with large vaulted foyer, large windows and ski lockers. The onsite amenities include two (2) hot tubs, one (1) swimming pool, sauna, outdoor grills, sand volleyball court with outside gathering space. Moose Hollow has four (4) floor-plans ranging from 1100-1575 SF sporting 2-3 bedrooms. Newer Buildings have radiant heat in the below grade levels. The neighborhood is located at the entry of Wolf Creek Resort and has daily UTA transfers to Powder Mountain in Winter months. All reservations are billed a one-time processing fee of $30. Departure clean is $175. Cancellation Policy: Any reservation canceled 30 days or more prior to arrival will have their deposits refunded minus the $30 processing fee plus any credit card fees. Reservations canceled within 30 days of arrival will forfeit their deposit.